Fancy a break from the cake? This tart will do the trick! 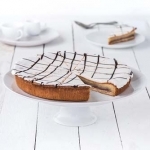 Developed from the venerable Bakewell pudding and of mysteriously unknown origin, the Bakewell Tart is a relatively recent innovation having only started appearing in the early 1900s - although its predecessor is much older. What is known is that this fusion of almonds, jam and flaky pastry is one of the most delicious things conceived by mankind, and is a sure-fire hit at both casual and formal parties. Sold by the slice and as a whole cake.